View of a red duiker.The Red Duiker is smaller than the Common Duiker. Standing, it is 420mm at the shoulders and has a mass of 12 Kg. The upper parts are a deep chestnut-red and the lower parts of the flanks and under parts are a pale chestnut colour. The nape and throat turn ash-grey as the animal ages. Both sexes carry short, straight horns. The horns have coarse basal rings and longitudinal striations, but are smooth towards the tips. Red Duiker forages on freshly fallen leaves, fruits and flowers from forest canopies. Foraging occurs mostly during the early mornings and late afternoons. 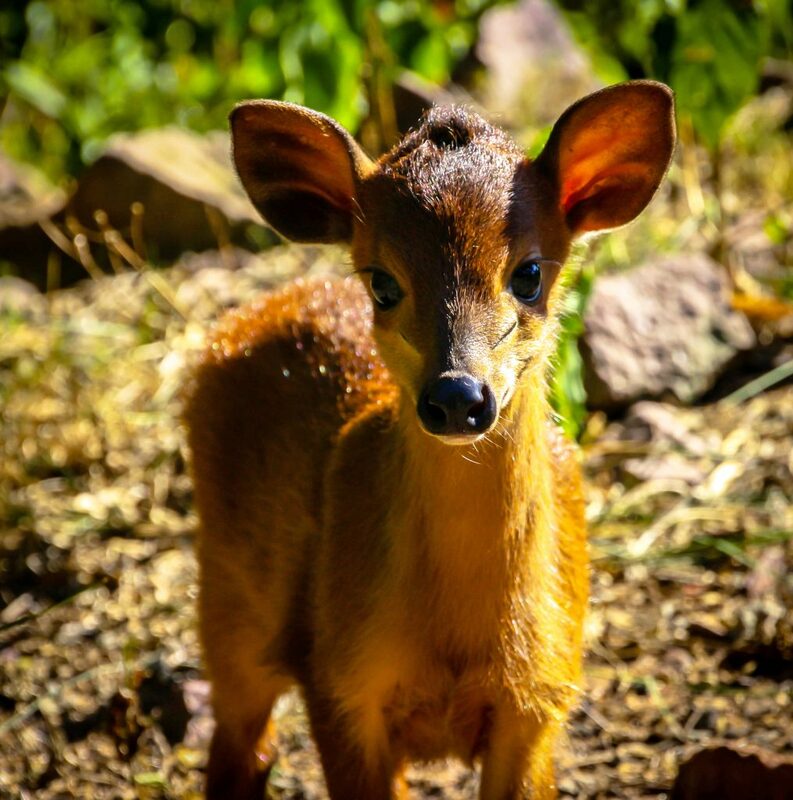 Close-up of a red duiker.Single lambs are born after a gestation period of 210 days. Calving intervals are about 235 days. They are non-seasonal breeders. The young weigh about one kilogram at birth. A single offspring is born and will stay with its mother for up to about six to eight months. Males take no part in rearing young but both sexes will respond to a distress call from the calf. Red-flanked Duikers are territorial, and normally live in pairs, pairs with one dependent youngster, or alone. The only times they form groups larger than three are at water sources, salt licks, or fruit falls that occur at territorial boundaries. Males are particularly territorial, and are combative with one another if they come into contact. Red-flanked Duikers do a great deal of scent marking, using a substance secreted from the maxillary glands near their eyes. A Duiker will rub its face on grass, twigs, bark or other surfaces to mark its territorial boundaries, or even on its mate or calf to ‘label’ the other animal. The Red-flanked Duiker is found in gallery forests, forest edges, woodland edges and clearings and is decidedly less confined to dense forests than most other Duikers. Region they are most commonly found in.The Red Duiker’s distribution in South Africa is confined to the eastern coastal forests in KwaZulu-Natal as far south as Umzumbe, whereas isolated populations occur on the Mpumalanga escarpment. In South Africa it is classified as rare. Distribution of the Red Duiker appears extensive on the map, but considering its habitat restrictions it is actually occurring in a patchy and discontinuous pattern.